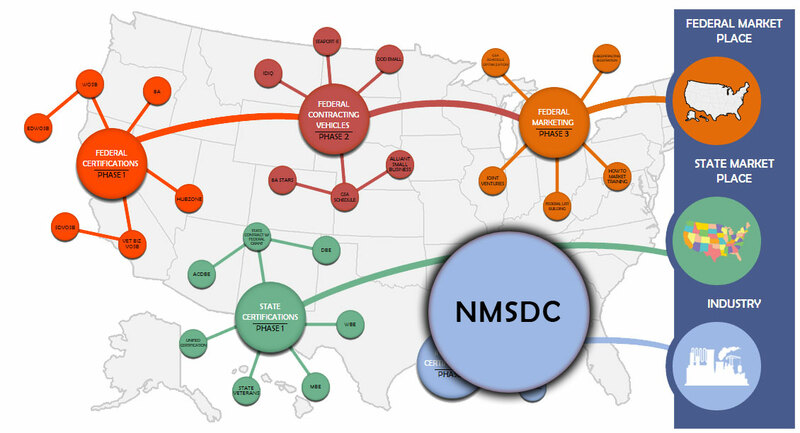 The National Minority Supplier Development Council (NMSDC) is the nation’s industry standard minority business advocacy organization. Its network includes 23 regional Councils nationwide that issue the certification and most importantly over 1,750 of the nation’s largest public and private corporations (460 are national corporate members). Certification is performed with the regional council that supports your business’s home office. The NMSCS has created standardized procedures that assure consistent reviews and certification while permitting for tailoring for various specialized services offered by its Regional Councils. Minority businesses must be at least 51% minority-owned operated and controlled. For the purposes of NMSDC's program, a minority group member is an individual who is at least 25% Asian, Black, Hispanic or Native American. Minority eligibility is established via a combination of screenings, interviews and site visits. Ownership, in the case of a publicly-owned business, means that at least 51% of the stock is owned by one or more minority group members. Stock Certificates and Stock Ledger. Minutes to Board of Director's meetings as well as Shareholder’s meetings. Bylaws (executed and attested) and Amendments (if applicable). All agreement(s) pertaining to ownership, operation, and control of the business. Business cards that list appropriate corporate titles, copies of resumes, copy of driver's licenses and proof of US Citizenship (Birth certificates or U.S. Passports only) for all Principals. Corporate Bank Resolution Agreement(s) to include Bank Signature Card(s). Business Lease Agreement(s) (and Security Deeds if home-based). Proof of general liability insurance and in some cases bonding. Copies of the businesses' cancelled checks.